I am a registered and confirmed delegate at Americans Elect, the odd, well-funded campaign to put someone nominated by the Internet on the November presidential ballot in order to ... either shake up the system, or elect Jon Huntsman. Now what should I do? 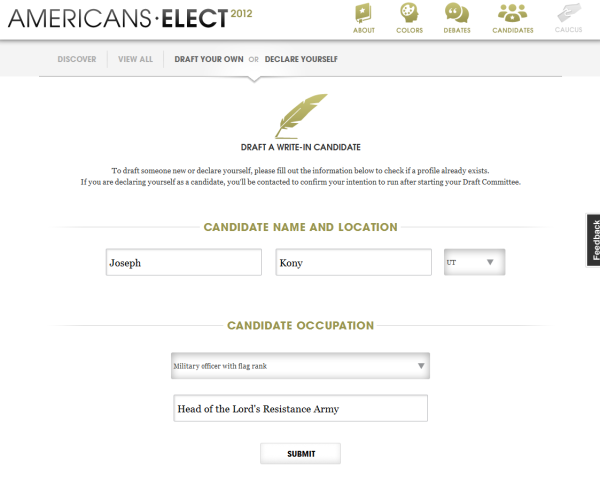 As a delegate, I have a very important role in selecting the Americans Elect candidate, and it involves some sort of eventual online caucus that Ron Paul will probably win. 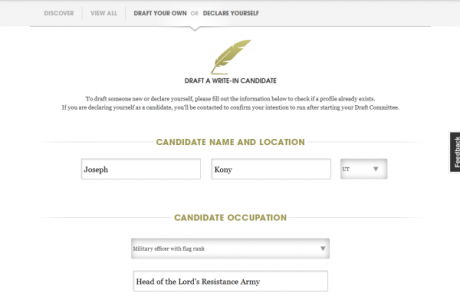 (Though the candidate has to actually commit to running under the Americans Elect banner, and make Web videos answering questions from delegates, and he or she eventually has to pick a running mate from a different political party. And the secretive Candidate Certification Committee, appointed by the Americans Elect board of directors, has veto power over the candidates. So maybe not Ron Paul.) Americans Elect CEO Kahil Byrd swears AE won't overrule its delegates, but they created various complicated institutional hurdles making it more difficult for candidates not from the centrist political establishment to succeed. The Candidate Certification Committee shall automatically certify as qualified any natural person who is eligible to serve as President and who has served in any of the following positions without removal from office of current criminal indictment or conviction: Vice President, United States Senator, Member of Congress, Presidential Cabinet Member, Head of a federal agency, Governor, Mayor of any of the largest 100 cities in the United States, Chairman or Chief Executive Officer or President of any corporation or nonprofit corporation or philanthropic organization with 1,000 or more employees, President of a national labor union with 100,000 or more members, military officer who has attained flag rank, Ambassador, and President of an American-based university with more than 4,000 members. This, though, was penned back when they were expecting a Michael Bloomberg to sign up for their effort. Now they can't even manage an Olympia Snowe. Primary voting begins in less than two months, and the only declared candidate who actually meets those qualifications is ... Buddy Roemer. At the moment, no candidate, declared or drafted, is on pace to actually meet the number of clicked supporters (10,000 for establishment candidates, 50,000 for outsiders) necessary to qualify for the ballot, which will almost certainly necessitate major rules changes. Americans Elect, then, is a high-profile third-party ballot access campaign without a candidate. "If it turns out we’re a shady front group with an ulterior motive then when that becomes apparent," they write in their FAQ, "you can kick us to the curb and choose one of the major party candidates in November." Of course, you don't need an "ulterior motive" when your stated motive is dumb and your methods are obtuse to the point of self-parody. "Shadiness" is obviously relative, but refusing to disclose your funding sources doesn't look great. AE swears, though, it never meant for a few rich people to fund the whole thing. According to the Americans Elect model as originally designed, an eventual flood of passionate small donors would eventually cover most of the organization's funding. The huge donations from rich people were loans, which would be paid back. This was supposed to be reassuring -- secret millionaires will in the end have no more ownership over the process than regular folk! -- but it actually meant that everyone giving Americans Elect money was effectively donating directly to a secret millionaire. Americans Elect suggests that if we had to do it all over again as a nation, this is how we'd decide to select candidates. It might be right, if you have an extremely cynical impression of who'd be in charge of a 2012-era constitutional convention. The entire process is sort of a "political party" reimagined as a modern corporation, and repaying creditors is, naturally, a top priority. It is probably safe to assume that regular folk have not been lining up to send Americans Elect their cash. While AE has promised that no individual will have donated more than $10,000 once future donors help AE repay those multimillion-dollar "loans," John Lumea noticed last week that the board of directors had introduced a rule change suggesting they were going to relax that limit. The Americans Elect Board unanimously voted to ensure that no supporter would cover more than 20 percent of AE’s budget. In the event that any one supporter exceeds that percentage, there are provisions created to expedite repayments to that supporter. AE delegate/gadfly Jim Cook, of Irregular Times, attempted to formally object to this rule change, which is his right as a delegate. He had 72 hours to respond. Then he had 48 hours to get 10,000 delegates to join his objection. There is no means of contacting AE delegates en masse. AE posted his objection on its website -- under the "About" tab, and then under a link titled "Board Decisions." By the time the window for objections closed, on Friday night, about a dozen delegates had managed to click through and register their complaint. The board's decision stands. Thus far, Americans Elect's most respectable (and independent) supporter is Lawrence Lessig, who has defended his support by saying he thinks it could possibly nominate a "real reform candidate," by which he likely means lovable old Buddy Roemer. "I am a critic of AE to the extent it allows anonymous donations to support it," he writes, but he points out that the candidate doesn't actually know the funders, and the candidate could end up being a good one even if the organization that got him or her ballot space was founded and funded by a bunch of hedge fund buffoons. Our political system needs fundamental institutional reforms more than it needs stunt third-party presidential candidates. If Americans Elect were pushing to elect 50 senators who promised to vote to abolish the Senate itself immediately upon taking office, I would send a check, but it's completely ignoring the Senate, and the House, and state legislatures, and judicial elections, and school board elections, and everywhere else where the insane (and pretty much exclusively right-wing) partisan extremism it accuses of crippling the country is actually happening. Actual Americans are responsible for electing a lot more people than just the president!